Every once in awhile, a movie comes along that captures you in such a way that it fully envelopes you as the story unfolds. Extremely Loud & Incredibly Close is one of those movies that takes you on a moving, emotional journey that may have you chuckling at one moment and tearing at another. 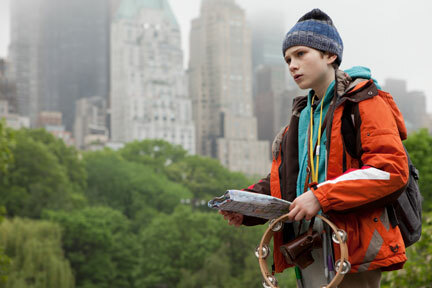 Adapted from the acclaimed bestseller by Jonathan Safran Foer, “Extremely Loud & Incredibly Close” is a story that unfolds from inside the young mind of Oskar Schell, an inventive eleven year-old New Yorker whose discovery of a key in his deceased father’s belongings sets him off on an urgent search across the city for the lock it will open. Oskar, played by Thoms Horn, is a very special boy who sees the world in a very unique way. Both brilliant, and quirky, the way that he sees the world is like one who sees the world as a giant puzzle, and when faced with a problem, there’s a systematic way to get to the solution. In Extremely Loud & Incredibly Close, the puzzle that Oskar is solving is to find the lock that his father’s (Tom Hanks) key will open. As he begins his journey, we get a glimpse into how a genius mind addresses an otherwise impossible task – breaking New York city into sections and routes and mapping his path to get from point A to point B. Along the way he meets many different people, many different types of people, and gets many different reactions. However his goal is always the same – to find the lock his key will open. Oskar isn’t alone in his world, though. His mother (Sandra Bullock) is ever-present, although just how much isn’t clear until the end of the movie. “Touching” is the perfect word to describe Extremely Loud & Incredibly Close. Watching Oskar’s story unfold, as well as learning about the stories of those he meets on his journey, evokes sympathy, empathy, and compassion. He faces and overcomes many challenges along the way and ultimately finds what he is looking for. Emotional. Heartfelt. Endearing. Inspiring. All of these words describe Extremely Loud & Incredibly Close. This isn’t a movie for young kids but is an excellent movie for older kids and adults. Extremely Loud & Incredibly Close is available on Blu-ray Combo pack, DVD and for download as of 3/27. You can purchase the Extremely Loud & Incredibly Close Blu-ray Combo pack on Amazon for $19.99 and on DVD for $14.99. I want to see this movie! I love movies that have a good message and show how someone solves their problems in a good way! We need more great movies like this one! I’ve heard mixed reviews on this movie,so I can’t wait to see it. I might have to get this one from the library. Thanks for the review.